I stumbled across this hobbyist’s Gettysburg diorama website on the Internet this weekend. It’s pretty impressive in the magnitude of the number of figures he painted, as well as the sheer size of the layout! There are 31,000 miniature soldiers!!! That’s a 1 to 5 scale for the entire actual battle of Gettysburg. It took five years to complete the massive task. Now, I love miniature wargaming, and have painted more than a thousand figures in the past couple of decades. I cannot imagine painting thirty times that amount, not to mention nearly a thousand horses, a couple hundred cannons, and sixty wagons! Wow! 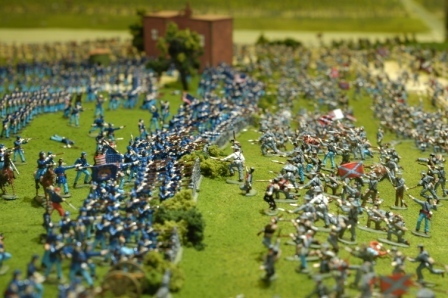 The largest Gettysburg diorama here in this area is the one at the Artillery Ridge Campground on Taneytown Road just south of Gettysburg. It was created by a guy from western Michigan and eventually wound up in Gettysburg. It’s much smaller, however, but it is well worth a look when you visit the battlefield. What is the largest miniatures project you have ever undertaken? Tell us about your efforts! Wow, that is a LOT of painting. I guess those cold Winters up there in Alberta are good for something to do indoors. It is very impressive. In the picture at the top. What is their size in inches. Whenever you get the answer could you send an e-mail to me?